Complete Civic Timing Kit includes matched parts from Japanese OE/OEM manufacturers. Everything you need to properly service your Civic timing belt. These are the same parts used and trusted by Honda/Acura, Dealerships and Technicians world-wide. Perfect Fit, Quality and Durability. This Kit Meets or Exceeds Original Equipment Specifications. This kit is a Perfect-Fit for. DX / EX / LX / HX / CX / HX / GX. Years : 1997 1998 1999 2000. Models: All 2, 3 & 4 Door Models with 1.6 Liter / 4 Cylinder DOES NOT FIT Si Models! Includes The Following Brand New Parts. All parts are new, fresh stock. 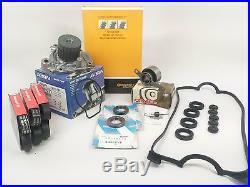 The item "Civic 1.6L Complete Timing Belt & Water Pump Kit 97-00" is in sale since Monday, March 10, 2014.